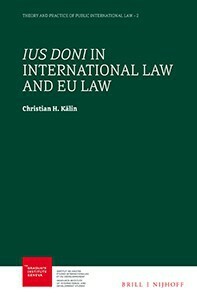 In Ius Doni in International Law and EU Law, Dr. Christian H. Kälin establishes the concept of ius doni in the contemporary legal and political theorizing of citizenship. Providing a comprehensive analysis of the subject, it discusses the legal and political concepts of citizenship. It also introduces a new term for what is already an increasingly common and accepted practice of granting citizenship on the basis of substantial contributions to the State. Consisting of two main parts — law and practice — the monograph analyses the ius doni concept in both international law and EU law, further tests its application in practice, and establishes best practices among states. Finally, the book discusses the conceptual and practical implications for citizenship. Dr. Christian H. Kälin, TEP, IMCM, Chairman of Henley & Partners, is considered one of the world’s foremost experts in investment migration and citizenship-by-investment, a field he pioneered. Holding master’s and PhD degrees in law from the University of Zurich, he is a sought-after speaker and advises governments and international organizations. He is the author, co-author, or editor of many publications, including standard works such as the Global Residence and Citizenship Handbook, the Kälin – Kochenov Quality of Nationality Index, and the Switzerland Business & Investment Handbook.